Expression of Greeen is a solo Exhibition by Murali Nagapuzha,an Indian Artist.This exhibition is in connection with Qatar-India Cultural Year 2019. Al Markhiya Gallery presents Perplexity Exhibition by Abeer Al Kuwari and Rasha Alem. Opening on March 12,2019,7:00PM in Al Markhiya Gallery Space in Katara Art Center,Building 5. Jerusalem in Mary’s Eyes Exhibition is a one day event,in collaboration with Turkish Embassy. 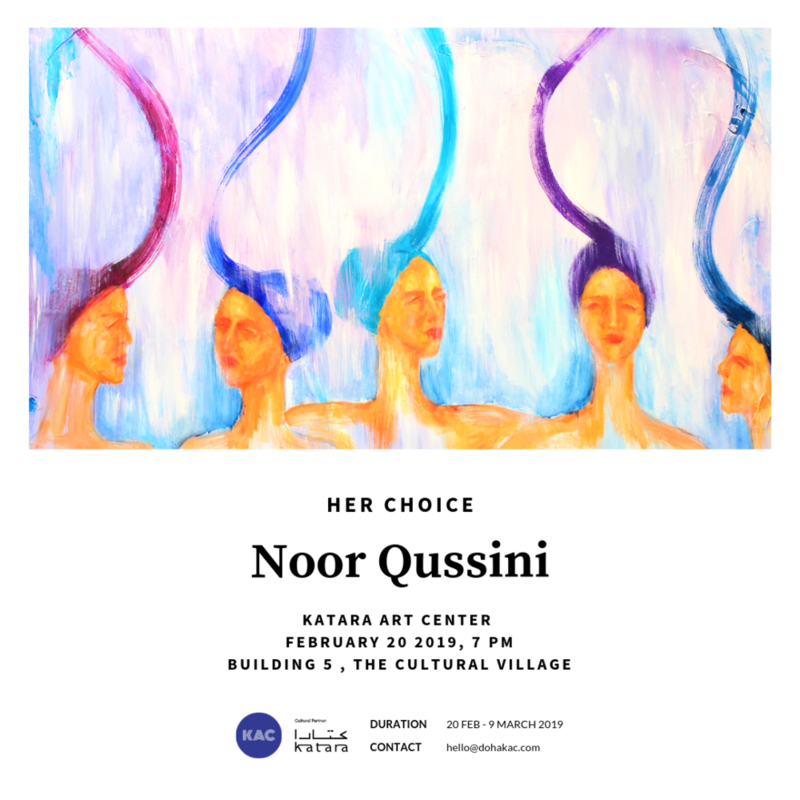 “HER CHOICE”,is an Exhibition by Noor Qussini, in which the artist’s draws inspirations from all women she met. Join us,as she tackles where women stands in this Era.Let your voice be heard and your opinion matters. NOOR QUSSINI is a Jordanian Artist,who was born and raised in Qatar,graduated from the University of Jordan with a Bachelor’s degree in Visual Arts.She is currently working as an art educator at The Museum of Islamic Art. Launching of Linfa,a product of Robonica with a concept of “Design Meets Food”.There will be a panel discussion and show kitchen.